My wife Catherine and I brought our two young boys ages eight and 10 to the Vineyard this week — our first time here. It was the culmination of a multi-week striper migration tour family vacation that started in Virginia early June. On Wednesday we were lucky to make it out to Wasque Point to throw some plugs for stripers with Peter Sliwkowski of Larry’s Tackle as our guide. We got a couple bites but no fish. Regardless, it was an awesome time fishing and our kids really hit it off with Peter who is as knowledgable as he is friendly. So we were surprised to wake up Thursday morning to a text message from Peter offering to take us out again that day to make a second attempt. The kids could hardly contain themselves until we crossed the Chappy ferry at 2 p.m. to get to the point before low tide. Needless to say, we spent an afternoon of fun crushing big blues in the surf with Peter. We even met the owner of Chappy Lures who gave one of his fine plugs to my youngest son who then went out and hauled in a big one with it. All catch and release. The very last fish of the afternoon right as we were packing up was a decent-sized striper that my oldest son caught along the seam of the rip. Big smiles. 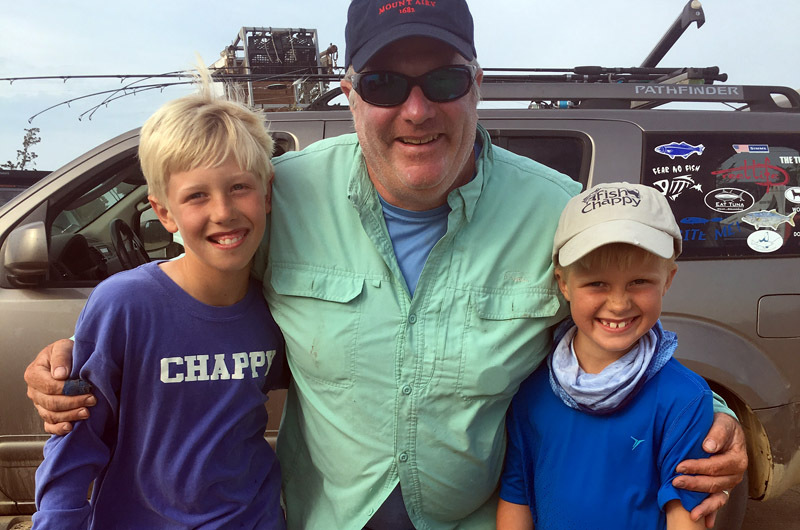 I just want to thank everyone on Martha’s Vineyard for a perfect vacation week for our family but especially to Peter Sliwkowski who went out of his way, above and beyond, to make sure two young very impressionable boys caught a taste of the rush that is surf fishing. Tonight they also got a taste of grilled striped bass on a rice pilaf we cooked up especially for them. I believe it’s people like Peter that make your island so incredible. We will be back! Peter is just the best....his love for fishing, the island and especially family is evident in everything he does!!!!! I also live in Virginia and know what a great person Peter is as well. Great fisherman and great human!